After the classification of the search query, the entity present in the query is identified. After Google successful classifies the category and entity name, it find out additional resources that bears a strong relationship with the main entity. At the last stage, Google returns resources related to the main entity along with other refined search queries that are related to the main entity which users have searched in the past. resources that bears the closest relationship with Shakespeare and also identifies other terms which the users would be willing to search based on the past search history. 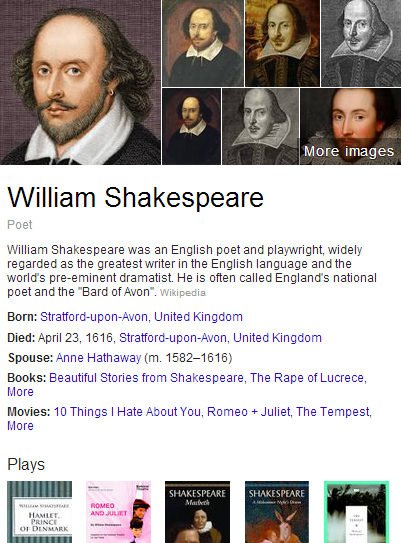 Now, have a look at the Knowledge Graph results which displays other poets (related entities) as per the main query entity (Shakespeare). The Knowledge Graph plays a vital part here helping Google identify and process queries.